Let me start this review off by stating out-right that a 5-star rating simply isn't high enough and certainly does not do justice to the incredible time my family and I had on the 6-day Grand Canyon/Colorado River expedition. From the guides, to the views, to the dining experiences and everything in between, this trip was nothing less than perfect. Let me elaborate. The guides... Oh the guides! How these four gentlemen Jack-of-All-Trades types had never had the opportunity to work together prior to this trip is questionnable at best as their team work, charisma, knowledge of the Canyon and River, and overall positive and infectious attitude seemed natural and effortless, not least since they are working for their guests 24/7. Not only do they drive the J-rig expertly and explain local geology, fauna, and flora with rehearsed insight, they also cook restaurant quality (and quantity!) breakfasts (fresh bread and eggs benedict!) and dinners (please note that these are 3-course dinners EVERY night in the middle of the CANYON, such as steak to order), offer additional help for any guest who may require it, ensure our security while on the river, and - let's be honest - carry our...unmentionable waste... in and off the J-rig. True superstars through and through. During our trip, we had two boats each counting 14 guests and 2 guides for a total of 28 guests and 4 guides. These were Greg/Newtie, Evan, Johnny, and Curt. My family and I were assigned to Curt and Johnny's boat and the 16 of us spent a week laughing and getting to know each other. Curt became somewhat famous when, on Day 3, my mother and I were riding in front during the Crystal (a level 10 rapid) and we both lost our grips, getting knocked out of position by some very serious waves. Curt wasted no time getting to our side, making sure we were alright, and promptly reminding us to ''GET BACK INTO POSITION''. Later, when a fellow rafter recounted the story at dinner (and it was recounted every day after that), everyone hailed Curt's bus monitor saying, and we all had a great laugh. He also quickly became famous for stating "Hold on, don't die" at every medium to large size rapid. And all this fun and safety (because they're priority is always safety) was possible thanks to Johnny's expert driving skills. When we were all screaming and laughing and trying to avoid the unavoidable crasing waves, Johnny was maneuvering the boat with ease and comfort. He was even whistling! The views... I would honestly never get tired of those Grand Canyon views. Granted, I had the chance to do a 3-day trek down and up the South Rim of the Canyon prior to this rafting trip, so I was already in awe (and in love) with the immeasurable beauty the Canyon has to offer, but still: the views guests get while rafting are like no other, as they offer a point of view outward, from the depths of the Canyon to the tallest peaks. We were lucky enough to get some day hikes in at a few spots along the way. 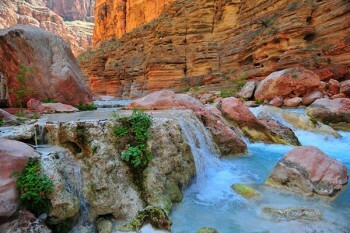 but the highlight was undoubtedly Havasu Falls. 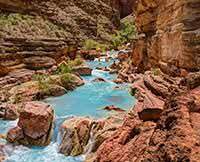 Turquoise water meanders from falls and creates pools along a side canyon that are especially beautiful against the orange-red color of the stone. It was like finding an oasis in the middle of the desert. To be fair, this expedition was not without its "challenges". For the unadventurous or uninitiated, assembling a cot and a tent, getting up at dawn (5:00am) and going to bed in pitch black, and using the "facilities", both on the river and on the campsites, were not negligeable. Though I had never been a fan of camping before, I quickly became accustomed to bathing in the 50F river, using unconventional and odorous restrooms, and waking up before the bats went back into hiding. I found that accepting each of these elements as part of the incredible experience that is a 6-day rafting trip down the Colorado River was the best way to fully appreciate said experience. By the end, when I was able to have my first hot shower and put on clothes that were not covered in sand as was the rest of my camping clothes, I didn't feel quite the exhilaration and relief I thought modern plumbing would bring. I like to think that this is because I was not quite ready to leave the River or the Canyon, that the adventure could have continued just a little while longer. I would have to say that my favorite part of this trip hasn't even been mentioned yet. Though the views, the fun and laughter, the guides, the food, etc. were all incredible, there is no doubt in my mind that my favorite part was forging friendships with the people I shared my raft with and being able to share all these experiences with them. Every day, we got just a little bit closer as we shared personal stories, life lessons, travel aspirations with one another. It didn't matter if you were retired, a student, a stay-at-home mom, or a CEO: we were all bound together by the River and the Canyon. Curt actually pointed out, on our last morning, that he did not recollect another group of strangers becoming so friendly and having that much fun with one another after such a short period of time. We all felt the same, and we all included Curt and Johnny as our new-found friends. Seeing as how this river expedition included a flight back to Las Vegas at the end, we (the 14 of us that are now calling oursleves a travelling family) decided to have a drink at a swanky bar to celebrate the time we shared together and, hopefuly, the time we will share in the future. We all laughed as we saw each other bathed, dressed in something other than quick-dry and paddle gear, smelling fresh and looking our best. This was hands down the best vacation of my life and I look forward to returning and doing it all over again one day. The combination of destination, guides, guests, and the rest can only be described as serendipidous.